Update, September 21: Nintendo have taken further action against the creator of Super Mario 64 Online, pulling his Patreon and most Youtube content related to the mod. If you’ve followed the story of any significant fangame based on a Nintendo property, you already know where this is going. After some tentative DMCA claims against the creator’s trailer for Super Mario 64 Online, Nintendo have taken further action to shut down his Patreon and a good bit of Youtube content. Consoles may be horning in on our turf now, but the PC will always be the home of the best online multiplayer. SM64O maker Kaze Emanuar let everyone know about the takedown via Twitter. It seems that Nintendo have also issued DMCA claims against uploads of the hack to Discord. Though Kaze says SM64O isn’t technically a romhack since it’s separate code that runs alongside the emulated game, it’s tough to imagine Nintendo having much time for that kind of reasoning. The Patreon had existed before SM64O became widely known, but most of Kaze’s work does feature Nintendo’s famed mascot in some way or another. It appears that the Patreon may be back up and running under a different name, but I suspect that won’t last much longer. Original Story, September 16:The PC is a strange and wonderful platform. It is where all other games go to die, have the code picked from their bones and be reborn, more powerful and terrifying than ever before. 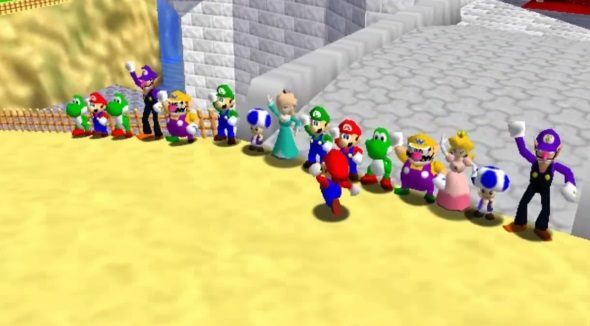 We’ve all wanted to play Super Mario 64 with our friends before, and now thanks to the tireless (and Patreon-funded) work of prolific modder Kaze Emanuar, we can. And it works great. Rather than a hack of the ROM itself, the Super Mario 64 Online tool seems to tap into the virtual RAM of your emulator of choice, sharing choice bytes of it – such as those relating to player position and gamestate – back and forth across a player-run server, and injecting the extra info required to render other players, and remodel them into a variety of new characters if so desired. It takes a little bit of setting up, but nothing too bad if you’ve ever monkeyed around with emulators before. You can see a little guide video here detailing the finer points of setup. Now, that’s not to say that everything is 100% ship-shape. In fact, you might have to fly the jolly roger for a few moments if you want to run around as Wario, biffing your friends in the face with your giant meaty hands. For starters, Nintendo have issued a DMCA takedown on the trailer for the mod, although on musical grounds rather than anything more serious. There is still the chance that a cease-and-desist on the project may be ordered, but given that it’s not technically a romhack, that might be difficult for even Nintendo to arrange. In an amusing twist, the mod’s creator seems more annoyed at IGN for uploading their own copy of the trailer (which has not been pulled, and we’ve used above), rather than Nintendo for taking down his. Despite this minor legal tussle, a video explaining the situation has gone up and a new version of the mod was released just recently, and development is continuing. You can keep up with info on Super Mario 64 Online via its official forums and Discord channel. It would seem that for this project at least, the genie is fully out of the bottle, and Nintendo are unlikely to get it back.